I am a hard working dedicated student athlete. I always go 100% in school and on the field. I am very coachable and disciplined. I love to play football, and I always try to be a positive role model to the younger players on my team. 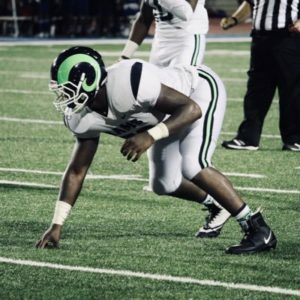 Barnes had around 13 sacks on his junior year making him one of the leaders in his classification He batted down 3 passes as well and tallied a total of 60 tackles. He has a quick first step and I really like the length I’m seeing from Barnes. Very long arms. He is a very aggressive football player, and if he can continue to work in the weight room I think he could really make a jump. His lateral quickness is unique for a defensive end. Barnes is a really good football player and shows the athletic potential to play P5 even. Senior year he is over 250 lbs, and looking a whole lot more like a SDE at the next level. Love his energy and passion he plays the game with, and starting to think he has the frame to end up being 280 at the next level. Good motor to his game, that’s self evident in his sack and tackle for loss totals both his JR and SR year.